The Biocidal Products Regulation (BPR, Regulation (EU) 528/2012) deals with the placing on the market of biocidal products, which are used to protect humans, animals, materials or articles against harmful organisms like pests or bacteria, by the action of the active substances contained therein. This regulation aims to improve the functioning of the biocidal product market in the EU, while ensuring a high level of protection for humans and environment. The text was adopted on 22nd May 2012 and became applicable from 1st September 2013, with a transitional period for certain provisions. It replaced the Biocidal Products Directive (BPD 98/8/EC). For ECA (Electro Chemical Activation) manufactures the BPR required that they apply for an active substance authorization and be listed on a so called article 95 list by the 1st of September, 2015. In 2013, several ECA manufactures looked into taking action in this regard. One way would be to buy a Letter of Access (LoA) from a company who already had been listed under the BPD program. At that time two companies had created a common single dossier under the BPD, which was added to the Article 95 list of the BPR automatically. The price to buy a LoA for this common dossier was however too high to be of interest to those ECA manufacturers. In November 2013 the idea to form a consortium with the goal of creating a single dossier, while sharing costs amongst its members, was born. A provisional budget showed that with 10 members this could be achieved for approximately 20% of the costs of buying a LoA to the already existing dossier (LoA price for 10 companies, November 2013). 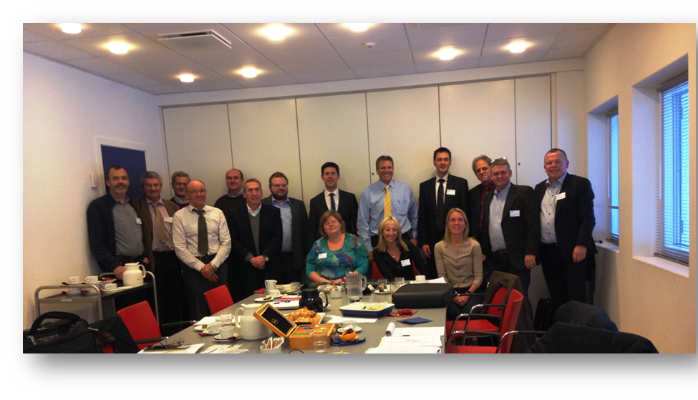 The first meeting took place in Copenhagen in January 2014 with 12 potential members (Picture from ECA Consortium meeting in Denmark, January 2014). The participants decided to proceed with the European Biocidal Product Regulation consortium and in spring 2014 the consortium was born with 11 initial members. A board of 5 members and a chairman were elected, along with a 3 member technical committee. A set of guidelines were established to regulate the dossier work, and ensure cooperation amongst members. A time line for the project was established and members each made an initial payment to the consortium. DHI, a consulting company in Denmark, was appointed to prepare the dossier application. The first step was to perform a Data Gap Analysis to get a clear picture of what information was available for free or available from the members, and what was still needed and had to be purchased from third parties. At the same time, the 11 members derived a common specification for the active substance in their products, which became the base information for the dossier preparation. The Gap Analysis was finalized at the end of September 2014 and the members decided to go forward with the dossier work. The revised budget showed now the common cost was dropped down to 7 % compared to buying a LoA to the already existing dossier. In November 2014, the EU commission determined that the precursor had to be included in the dossier information, and that it was possible to submit an alternative dossier, notwithstanding the existence of the existing dossier from the Article 95 listed companies. This further reduced the budget to approximately 5% compared to buying a LoA to the already existing dossier. Steptoe & Johnson LLP was selected as legal counsel for the consortium. An agreement was prepared by Steptoe & Johnson LLP and was signed by the members in spring 2015, formally establishing the consortium. The membership fees were received from members in March 2015, and DHI began the dossier work. At the same time the content of the already Article 95 listed dossier became public, and it turned out that it contained no information what was needed for our own dossier. The dossier was submitted to ECHA (European Chemical Agency – the responsible authority for the BPR) on the 23rd of June, 2015. By that time, the number of consortium members had increased to 14, and an additional 6 companies had purchased a LoA to our dossier. In September 2015 ECHA requested additional data about our precursor, delaying the approval. The data was collected and submitted on the 19th of October, 2015. At our annual member meeting on the 1st of October, 2015, the members decided to continue the common work up to the BPR product authorization. They also decided to establish a trade association to promote the ECA industry, to increase public knowledge about ECA and to highlight the benefits of ECA. The goal is to continue to cooperate for future approvals and applications, where we hopefully can keep costs down for the members, as we did with the BPR. On the 1st of December, 2015, we received notification from ECHA that our dossier had been approved and members of the consortium would now be Article 95 listed. Two years’ work had been successfully completed. For more information about the European Biocidal Product Regulation please visit www.radicalwaters.com or follow us on facebook www.facebook.com/radicalwaters. Radical Waters (Pty) Ltd has spent over 20 years focused on developing and commercializing its patented green ECA technology. The company has installed operating devices on six continents and in 27 countries primarily for blue chip companies. Radical Waters’ products are used in a wide range of markets formerly dependent on chemicals for controlling contamination and bacterial infection. The company has a focus on markets that include beverage production, meat & seafood, sauce manufacture, milling & starch and hospitality. Radical Waters (Pty) Ltd produces devices in its factory outside Johannesburg, South Africa. Radical Waters International (UK) LLP in London is responsible for international distributor relationships.